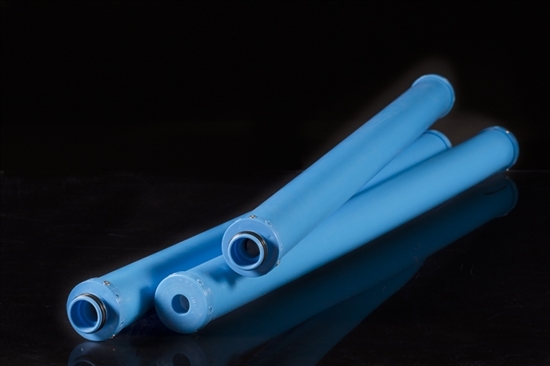 OilClog™ absorption cartridges are effective in various water treatment applications, but are specifically designed for produced water treatment at oil & gas production facilities. They are highly efficient in the removal of free and dissolved hydrocarbons (TPH) and emulsified oils from water and successfully applied in the oil and gas industry, bilge water treatment systems, contaminated surface water run-off and other industrial process applications. Contaminated water flows from the top to the bottom of the cartridge trapping the oil inside the element. Maximum contact time due to top – bottom flow path. 99% removal of strong emulsified oils in one single pass. High absorption capacity, low waste volume. No direct contact with saturated media during handling. Fit into existing cartridge filter units. Manufacturing process eliminate voids in media and bypass issues.